Despite my disgust at all the vegetables during my growing years, I somehow grew a fondness for Lau which is called Bottle gourd in English. Now I eat all the vegetables but there was a time when I didn't touch any vegetable apart from potato and some selective veggies. Gradually with the passage of time as I grew up into a woman and understood the benefits of eating veggies, I stopped turning up my nose at them and gladly added them to my regular diet. My mother cooked Lau Chingri (Bottle gourd with shrimps) and Lau Bodi amazingly and what was interesting that she hardly added any spice to the dish. 'Vegetables with its raw flavour intact tastes best' was her opinion and I also comply with the idea. Badis are cone-shaped dumplings made from lentils and usually sun dried. But you can bake them at home also. Badis add a different dimension to even an ordinary simple vegetable dish and in eastern parts of India where I hail from, badis are frequently used in cooking. Note: Panch phoron is a mix of five spices in equal proportions, including fennels seeds, cumin seeds, nigella seeds, methi seeds and black mustard seeds. 1) Heat oil in a wok. Fry the badis till they are orange in color. Take them off the flame and keep aside. Now into the same oil add panchphoron and allow it to crackle. 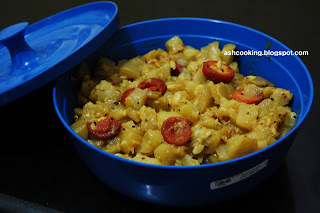 2) Add the chopped bottle gourd. Stir in. Cook covered on medium heat for 5-10 minutes and stir occasionally. 3) Add turmeric powder and green chillies. Don’t need to add water as fresh bottle gourd discharges water from its body while being cooked. Nevertheless, if the mixture turns dry, add 1/2 cup of water. 4) Cook covered till bottle gourd is cooked through. Just before removing the dish from the heat, add the fried badis and mix in properly. 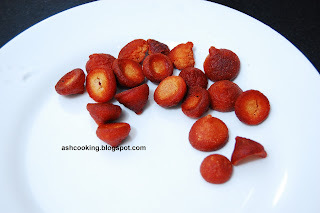 5) Serve hot with rice or chapati.